The Orthodox Jewish Cemetery behind the rapidly growing high-tech buildings of the MOM-park is one of my favourite discoveries in Budapest. In this city it is a common piece of advice to look up when walking on the streets not to miss interesting details, but here’s mine: look behind things! Behind doors, gates and of course walls. Lucky me –I am tall enough– so I got a peek of this mysterious garden when first passed by. Among other things, Budapest is well known for its synagogue in Dohány utca, which is the biggest in Central Europe. Actually, there are so many other exciting pieces of Israelite heritage here: a vivid Jewish culture was born in the capital after the members of this religion received equal rights in 1867. 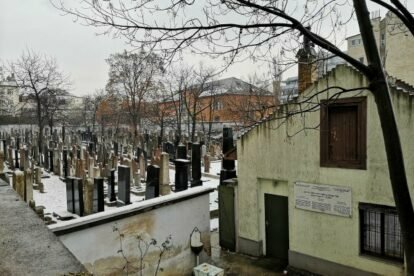 The orthodox Jewish cemetery is the oldest burying place of the Israelite residents of the Buda side. It has closed its gates since 1961 and can be visited only occasionally, but you can have a look at the precise rows of the Hebrew-inscripted stones over the brick curtains. Pro tip: try the left side; there is a lower piece of wall on the neighbouring building where you can easily step onto to look inside. Do not be embarrassed, no one will (or should) judge you for your curiosity. For more details visit this site.